Ohio became a state March 1, 1803, the 17th state admitted to the Union. The “explorer’s mystique” surrounds the name of Christopher Columbus. Though he never set foot on the main part of what became North America, Columbus is generally regarded as its European discoverer. His name became a poetic representation of America as the settlement of the United States began. When Ohio became the 17th state in 1803, the capital was in Chillicothe; it moved to Zanesville and back to Chillicothe as legislators fought for a more centralized location. Franklinton, Dublin, Worthington, and Delaware were considered; the compromise was to select none of them, but to create an entirely new city. A site was chosen on the high banks of the Scioto River that offered good transportation. A day was set aside to select a name for this new city; many were proposed but the argument for “the discoverer of America” won out; Columbus became the new capital city on February 14, 1812. The city was designed from the first as the state’s capital; the town was surveyed, and various city lots were put up for sale. By 1813, a penitentiary was built, and by the following year the first church, school, and newspaper were established. 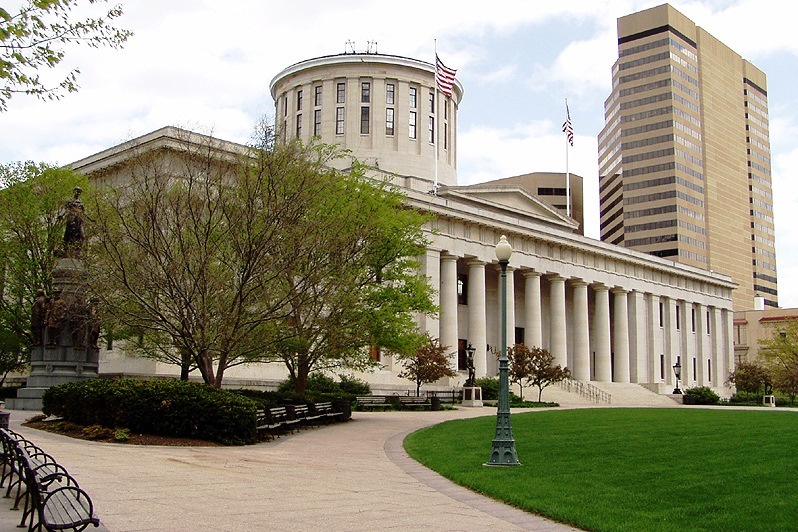 The General Assembly met in Columbus for the first time in 1816, on completion of the first statehouse. Columbus grew quickly due to its proximity to major transportation routes. By the 1880s there were almost 200 factories in operation, as well as iron foundries and brewing companies. Today Columbus is Ohio’s largest city in both land area and in population. Highrise office buildings, cultural institutions, and sweeping condominiums fill the area that once was dense forestland. Unique neighborhoods include Short North – north of downtown but short of the Ohio State University campus – and German Village, a historic area of brick-lined streets, quaint homes, and authentic German food. Jack Hanna is Director Emeritus of the Columbus Zoo, which attracts over 2 million visitors a year. Contributions of native Ohioans are showcased at the Jack Nicklaus Museum, the James Thurber House, and the John Glenn Theater at COSI, the Center of Science and Industry. The current capitol sits in a 10-acre park in the downtown core; construction was begun in 1839 but not completed until 1861 due to a cholera epidemic, budget shortages, and a work stoppage that lasted eight years. The Greek Revival building features a flat-topped drum tower. Open daily, it offers a number of tours; the Ohio Portals of History Tour includes a Victorian lunch or dinner at “Miss Emma’s Table.” On the capitol grounds stands a simple copper statue honoring a man named Christopher Columbus; nearby, at Riverfront Park, a replica of the Santa Maria is moored. The highrise condos soaring riverside; Germantown’s row houses and quaint brick-paved streets; the creaky floors in the Thurber house, where staff plan writing programs as visitors browse; the engaging interactive exhibits at the Statehouse. Mountains near: Campbell Hill, about 50 miles northwest of Columbus, has an elevation of 1,550 feet and is part of a glacial moraine.